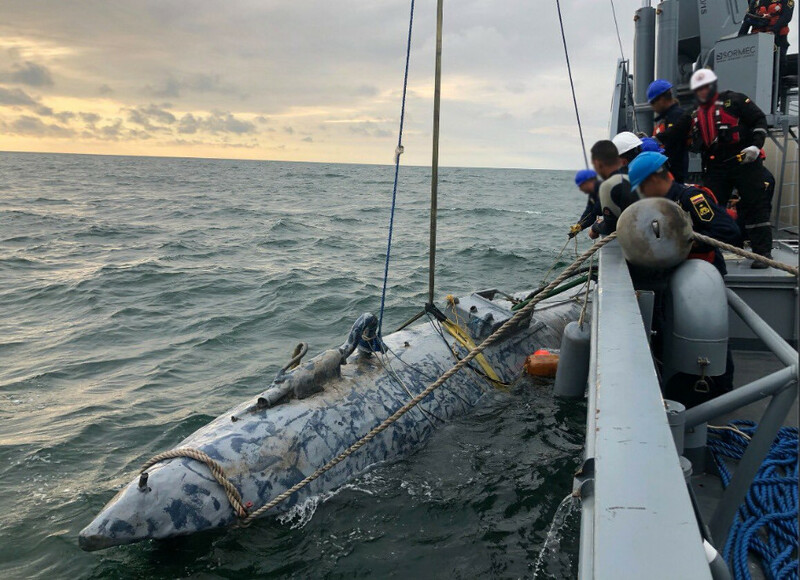 A Low Profile vessel (LPV) intercepted by the Colombian Navy in March may represent the first sighting of a new family of nacrosubs. The camouflaged vessel combines the once-standard layout of having the payload in the bow, cockpit amidships and single internally mounted engine in the stern with the recent trend to Very Slender Vessels. VSV-narcosubs started to be seen spring 2017 and have evolved into two distinct lineages, but all have featured aft-mounted cockpits and outboard motors. The boat is 20 meters long and just two meters wide giving a fineness ratio of 10:1. Covert Shores brings us another update on Narco trafficking vessels and recent captures by the USCG and by Colombia. This entry was posted in Drug Interdiction by Chuck Hill. Bookmark the permalink. This report has been updated and expanded. You can see it here.